FDD 2-250 Insulated Wire Female Spade Receptacle Connectors Product Name: Crimp Terminals .. Female Disconnect Terminal - 4.8mm Overview: Crimpable Faston receptacle connector for.. Female Disconnect Terminal - 6.3mm Overview: Crimpable Faston receptacle connector for f..
FLDNY 2-250 NYLON-INSULATED FLAG FEMALE DISCONNECTS - Blue Product Name: Female Flag Terminals..
FLDNY 2-250 NYLON-INSULATED FLAG FEMALE DISCONNECTS - Red Product Name : Female Flag Terminals.. Insulated Fork Terminal - AFT2-4 Blue Overview: Insulated fork terminals are made from brass..
MX DC Socket Female Chassis Type (2.1 X 5.5 mm) Overview: MX DC sockets are used for connectin..
MX XLR 3 PIN MIC CONNECTOR PANEL MOUNTING MX 3 Pin Microphone XLR type connector..
Ring Terminal - 4.3 mm High quality, solderless ring terminals for high power, high curre..
Ring Terminal - 5.3 mm High quality, solderless ring terminals for high power, high curre..
Ring Terminal - 6.4mm High quality, solderless ring terminals for high power, high curren..
2 Pin Screw Terminal Block Connector 3.5mm Pitch Specifications: Pitch: 3.5mm P..
2 Pin - Side Entry Right Angled - Screw Terminal Block Overview: For screw pluggable system, t..
3 Pin - Side Entry Right Angled - Screw Terminal Block Overview: For screw pluggable system, t..
3 Pin - Side Entry Screw Terminal Block 3.5mm Pitch Specifications: Pitch: 3.5mm Poles: 3..
9 Pin PC Mount Ceramic Socket Overview: PC mount 9-pin miniature ceramic tube socket. 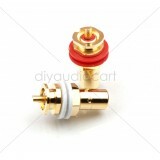 Techn..
9-Pin Vacuum Tube Socket Ceramic - PC Mount Overview: PC mount 9-pin miniature ceramic tube so..
Amphenol - RCA Phono Connectors Diecast SH GLD PLTD CONT COLRD GROM - BLACK Specifications: ..
Amphenol - RCA Phono Connectors Diecast SH GLD PLTD CONT COLRD GROM - RED Specifications: ..
Amphenol - RCA Phono Connectors RCA PLG BLK Flex Grommet - Chromate Black Specifications: ..
Chetan - 1/4" Mono (TS) Phone Plug - Gold Overview: The Quiet Plug is an innovative 1/4 m..